The newest Writing Excuses podcast episode is called "What The Avengers Did Right." It has a bunch of spoilers for that movie and talks about it from the point of view of a writer. I've uploaded all of Ben McSweeney's awesome illustrations for THE RITHMATIST. This includes the map (which isn't in the ebook right now) and a couple of doodles that didn't make it into the final book. If you have the audiobook, we prepared a script for Michael Kramer that included the text from the diagrams so you shouldn't be missing anything essential, but it will probably still help quite a bit to be able to see these illustrations. If you haven't seen them, I also have interior illustration galleries for THE WAY OF KINGS and THE ALLOY OF LAW. Tor.com's reread of THE WAY OF KINGS has reached the end of part one. The most recent post covers the first set of interludes and talks about the search for Hoid. Today through Sunday I'm in Phoenix for Phoenix Comicon. Here's my schedule. Kick of Phoenix Comicon 2013's Books and Authors programming with a brief look at what all is going on this weekend and a group interview with several of our author guests conducted by Peter Orullian. Join Brandon Sanderson and some Wheel of Time fans for a discussion of the series and its completion. The "Firstborn"/"Defending Elysium" convention exclusive hardcover will be available. Join the editor and four contributors to Unfettered, a new anthology. Learn about its creation from the editor, Shawn Speakman, while contributors Terry Brooks, Brandon Sanderson, Kevin Hearne and Peter Orullian talk about their stories. The Phoenix Comicon Exclusive Edition of Unfettered will be available in a limited quantity. Magic systems and fantasy go hand in hand. Join some of our author guests as they talk about how they make it work and how they make it believable. 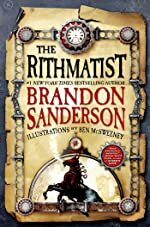 Join New York Times Bestelling Author Brandon Sanderson, author of the Mistborn series, The Stormlight Archive, Alcatraz, The Wheel of Time (with Robert Jordan), and others including the new novel The Rithmatist, for a talk and Q & A about his work past, present, and future. Cost is $10 and slots are limited. Sign up at Game Central. Some of today's most popular epic fantasy writers talk about what epic means to them and how they write it. How do writers create worlds for their stories anyway? Join our panelists and find out. Tor.com's reread of THE WAY OF KINGS reaches chapter 11 today, which is Kaladin's low point. 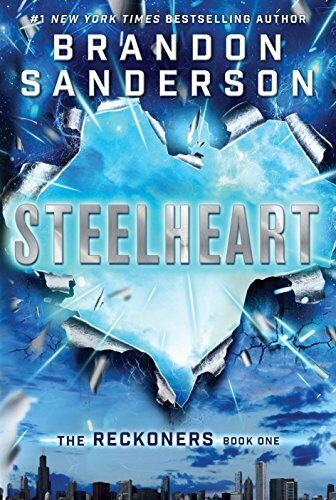 My YA dystopia STEELHEART comes out in September. Today the Onion AV Club put up the prologue of the book. Check it out! I'm in the middle of the tour for my YA fantasy THE RITHMATIST right now; I'll be in Denver tonight. If you're not near the cities I'm signing in, you can still grab a signed copy by ordering it from one of the bookstores I've already stopped at. They have quite a few copies and will be happy to ship one to you. I'm super excited about The Rithmatist. Imagine a world where people duel using a magical, StarCraft-like system where one draws units and structures in chalk. Those come to life once you complete them, though they remain two dimensional, and you can use any drawing surface as a dueling platform. The main character, Joel, gets to go to a school specializing in this magic, though he can't actually use it himself. (He is the son of the cleaning lady, so he gets free tuition.) Students start disappearing, and he gets mixed up in the mystery. While I love my Alcatraz series for younger readers, that series is very bizarre and quite different from the style of my adult books. I've found that many of my readers wish I had something more "Brandonesque" to hand to their younger siblings, children, nieces and nephews, etc. Well, this is the book for you. Deep worldbuilding, a complex magic system, and a sharp plot. Hopefully you'll all be willing to give it a look. The sample chapters are here and you can hear the beginning of the audiobook here. Read onward on this blog post if you want to hear some of the background of The Rithmatist and how it came to be. Otherwise, check out those sample chapters, and come see me on tour! Six years ago, I was writing a book that I hated. Now, that's both rare and common for me at the same time. I tire of pretty much every book I work on at some point, usually during the revision process. I push through and get over it. That's what you do as a writer. By the time I'm done with the process, I'm tired of the book—but it's the good kind of tired. The "I worked hard, and now have something awesome to show for it" tired. Unfortunately, that wasn't happening for this book. Called The Liar of Partinel, every chapter was a chore to write. Though it had started very well, it continued to spiral farther and farther down the drain. I was familiar enough with my own writing by this point to realize the problems with Liar wouldn't work themselves out. The characters were boring, the plot forced. The worldbuilding elements never quite clicked together. I needed Hoid's story to be epic and awesome. It just wasn't. And so, I ended up "hiding" from that novel and working on something else instead. The Rithmatist. It started with some drawings and a purely creative week sketching out a world, characters, and magic. That week is the exact sort that turned me into a writer in the first place, and was a distinct contrast to the grind that had been Liar. I abandoned the book and dove into The Rithmatist (then called Scribbler), and wrote a book where everything just came together. It happens sometimes. It just works, and I can't always explain—even to myself—why. I finished the first draft of the book in the summer of 2007. In the fall, I got the call regarding the Wheel of Time, and my world transformed forever. The Rithmatist, though an awesome book, languished for years because I didn't have the time to devote to it. Doing a tour or contract for another teen book was impossible at that time, and beyond that I couldn't commit to writing any sequels or even doing any revision for the novel. I did tell Tor about it, though, and they started to get excited. The publisher tried at several times to get me to release it, but I didn't feel the time was right. I couldn't let my attention be divided that far. I was already stretched too thin, and I wanted my attention (and that of my readers) to be on the Wheel of Time. The month A Memory of Light was done and turned in, however, I called Tor and told them it was time to move forward. I'm pleased to be releasing the book now, when I can give it the attention it deserves. Anyway, thanks so much for reading! I hope you enjoy The Rithmatist. Just a quick update today. I'm on my way to New York for the release of THE RITHMATIST on Tuesday. More about that in another post tomorrow, but The Book Smugglers have an interview with me where I talk about it and about writing YA, among other things. This week's Writing Excuses podcast episode talks about the culture that surrounds the writing community and the conventions we attend. Tor.com's reread of THE WAY OF KINGS has reached chapters 9 and 10, including Kaladin's first flashback chapter. My YA fantasy novel THE RITHMATIST comes out next week. Read the first 5 chapters here and check out my signing tour schedule here. Tor.com also put up an article today talking about the book's magic system. I'm also pleased to report that Michael Kramer is narrating the audiobook for THE RITHMATIST. You can listen to the prologue and the first part of chapter 1 below. It will be available from Macmillan Audio via Audible and preloaded digital audio, and I assume via iTunes as usual though the listing isn't up yet. In non-Rithmatist news, my Hugo Award-nominated novella THE EMPEROR'S SOUL has its ebook currently at a $2.99 special price on Amazon for the month of May, and that's matched at other ebook vendors. The most recent Writing Excuses podcast episode covers blocking. If you're aware of blocking in the context of theater and wonder how it translates over to fiction—or if you have no idea what blocking is—check out the episode! I've missed linking to a couple of Tor.com's reread posts for THE WAY OF KINGS. The first one covers chapters 5 and 6, and the second covers chapters 7 and 8. They will put up another post tomorrow. I'm busily writing the sequel, WORDS OF RADIANCE, and you can see that the progress bar on my site is up to 70%, though that may be a bit out of date. My assistant has also put up another Twitter posts archive covering the last eight weeks. I got back from JordanCon a few days ago. Often times at cons and signings, my readers bring me small gifts. I'm deeply grateful for the time and thought put into these, and I try to post pictures of some of them from time to time. JordanCon was no exception. Here are some of the cool things you all gave me. A highlight of the con for me was going to lunch with one of my idols, Michael Whelan. (For more on how much I love his work, see here.) He gave me one of the signed limited editions of The Art of Michael Whelan, which includes a beautiful original illustration (below). The book and the illustration are absolutely gorgeous. I can't wait to see what Michael comes up with for the cover of Words of Radiance. Of course, readers brought me all sorts of other goodies: mac and cheese, more Magic cards (vintage! ), books, an awesome wooden baby rattle, traditional songs rewritten with Wheel of Time-inspired lyrics, and a book of letters from the Black Tower Social Group from Dragonmount. One reader, a student of various languages—including American Sign Language—is working on putting together a sign language based on Aiel maiden handtalk. Check out her blog to follow her research. I should also mention that two of my readers, Kalyani and Rahul, cooked me a wonderful meal of traditional southern Indian food. Seriously, the food was better than what you might find in a restaurant. Again, I had a wonderful time at JordanCon. It's really the people and the hospitality that makes this a great convention every time I've gone. On Saturday Tor.com posted an essay of mine entitled "Terry Pratchett's Discworld Might Be The Highest Form of Literature on the Planet." I've mentioned my love of Terry Pratchett a few times on the blog before, but in this essay I lay out my whole case. Michael Whelan has signed prints of the A MEMORY OF LIGHT cover painting, that Harriet and I also signed at JordanCon. They look great! How do you prepare to write? How do you write stories that are important without being heavy-handed? Magical realism vs. Fantasy—what's the difference? Do you have recommendations or techniques for serving as a beta reader? Is it possible to do a serial with short stories and novellas all in the same setting? Why do publishers say they want crossed-genre books, but they're not publishing crossed-genre books? Picture books and books for beginning readers: can you 'cast on this for us? Can you do a 'cast on reading aloud? What is the primary thing you've learned from reading Literary Fiction that has informed your Genre Fiction writing? My YA fantasy THE RITHMATIST is coming out in two weeks (three weeks in the UK). Tor is doing a Goodreads giveaway of 15 copies of the final book. You can sign up here–but only if you're in the US. For those of you outside the US, I apologize—hopefully there will be something you can participate in soon. And if you missed the announcement of my book tour, you can find the list of tour cities here. Included on the tour is Phoenix Comicon, and I will bring my convention-exclusive "Firstborn"/"Defending Elysium" hardcover to the con. Also attending will be Shawn Speakman, whose anthology UNFETTERED will include the story "River of Souls," a deleted sequence from A MEMORY OF LIGHT. UNFETTERED doesn't come out until June, but there is a four-story preview (including "River of Souls") that will be available at Phoenix Comicon. Shawn is also auctioning off several signed books, including a signed limited edition of LEGION, to benefit Duane Wilkins of the University Book Store in Seattle. Duane is a very cool guy who has supported my career from the very beginning.